The main feature of the festival is, of course, the pumpkin patch, where you can select the perfect pumpkin from a huge patch of more than 2,500 pumpkins! The festival will also feature carnival rides, pumpkin decorating, a kid’s corn stalk maze, a scarecrow dress up village, ongoing shows and activities on the event main stage, and a variety of other fantastic fall attractions. There will also be a Pumpkin Food Court featuring a variety of sweet & savory pumpkin-infused treats, as well as a wide selection of traditional “fair food” favorites. There will also be adult beverages, including ice cold beer, available for purchase at the event’s multiple Pumpkin Beer Bars! Tickets to this all-ages event are $20 each, with free admission for children under 24 months of age. Included in the ticket price are unlimited carnival rides and access to the fall attractions and shows/activities on the main stage. There are additional fees for all food, beverage, and pumpkin patch purchases (price based on pumpkin size), as well as pumpkin decorating in the designated pumpkin decorating tent. There will be limited seating available at the event on a first come, first serve basis. Outside chairs are not permitted. 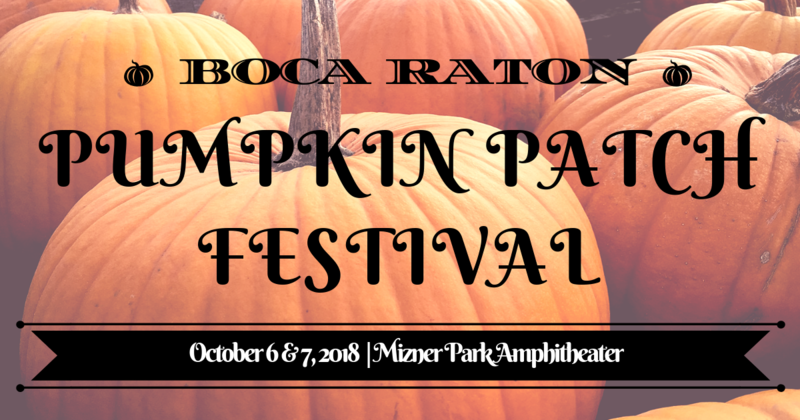 If you are one of the many who absolutely loves the Fall season and everything that comes with it, you do not want to miss the Boca Pumpkin Patch Festival at Mizner Park Amphitheater. Not only is this the perfect opportunity to get in the spirit of the season, but it is also the perfect, family-friendly way to spend a beautiful Autumn weekend in Boca Raton. We at Champagne & Parisi Real Estate look forward to seeing you there!